Our bibliographic systems have not kept pace with changing environment around us - the Internet. The continuing proliferation of formats, tools, services, and technologies has upended how we arrange, retrieve, and present our holdings. Our users expect simplicity and immediate reward and Amazon, Google, and iTunes are the standards against which we are judged and rightly adjudged poorly. Podscope is the first search engine that actually allows you to search for spoken words within any audio or video file. The Harvard University Library (HUL) has received a grant from the Andrew W. Mellon Foundation for a two year project leading to the deployment of the Global Digital Format Registry (GDFR). The GDFR will provide sustainable distributed services to store, discover, and deliver representation information about digital formats. "A Blogger at Every Table" means that we have an obligation to our fellow librarians to represent and relay important information to those who couldn't attend the numerous meetings at these events. UK Government - Department of Health has launched a site on "Cosmetic surgery and non-surgical cosmetic treatments". The site is expected to provide information enabling people to make an informed decision about whether or not to have surgery or non-surgical treatments. The site has been compiled to meet the requirements of their "Report of the Expert Group on the Regulation of Cosmetic Surgery". It includes list of all cosmetic procedures, with details of what each treatment involves, any potential risks, and what results to expect. There is also information on how to check that the care providers have the right qualifications and experience. Introduction. Specialised subject gateways have become an essential tool for locating and accessing digital information resources, with the added value of organisation and previous evaluation catering for the needs of the varying communities using these. Within the framework of a research project on the subject, a software tool has been developed that enables subject gateways to be developed and managed. Method. General guidelines for the work were established which set out the main principles for the technical aspects of the application, on one hand, and on aspects of the treatment and management of information, on the other. All this has been integrated into a prototype model for developing software tools. Analysis. The needs analysis established the conditions to be fulfilled by the application. A detailed study of the available options for the treatment of information on metadata proved that the best option was to use the Dublin Core, and that the metadata set should be included, in turn, in RDF tags, or in tags based on XML. Results. The project has resulted in the development of two versions of an application called Potnia (versions 1 and 2), which fulfil the requirements set out in the main principles, and which have been tested by users in real application environments. Conclusion. The tagging layout found to be the best, and the one used by the writers, is based on integrating the Dublin Core metadata set within the Topic Maps paradigm, formatted in XTM. So you want to search the largest bibliographic database in the field of Medicne i.e. PubMed. Let me tell you that you need Knowledge of MeSH for better precision and recall in your search results. The bad news is that MeSH is not easy to learn. But the good news is - US National Library of Medicine has produced a 12-minute video on MeSH. It is on development, structure and use of the MeSH vocabulary. ..Even before the Web was introduced,academic libraries had started to create digital libraries of trustworthy information.. ..Academic libraries now widely report that reference transactions have expanded from the reference desk to online chat,individual consultations, e-mail,and telephone.. ..If archives could be digitized and tagged with the proper metadata, they would no longer be location-bound and they would be much simpler to find and use..
Indian Medlars Centre (Bibliographic Informatics Division, National Informatics Centre, New Delhi - 110003, India)"
IndMED Site is a gateway to article published in Indian Biomedical Journals. It indexes about 77 of them. Arizona Heart Institute and Arizona Heart Hospital offers video podcasts for the public on healthy heart living at http://www.cvmd.org/ . A number of open initiatives are actively resisting the extension of intellectual property rights. Among these developments, three prominent instances — open source software, open access to research and scholarship, and open science — share not only a commitment to the unrestricted exchange of information and ideas, but economic principles based on (1) the efficacy of free software and research; (2) the reputation–building afforded by public access and patronage; and, (3) the emergence of a free–or–subscribe access model. Still, with this much in common, the strong sense of convergence among these open initiatives has yet to be fully realized, to the detriment of the larger, common issue. By drawing on David’s (2004; 2003; 2000; 1998) economic work on open science and Weber’s (2004) analysis of open source, this paper seeks to make that convergence all the more apparent, as well as worth pursuing, by those interested in furthering this alternative approach, which would treat intellectual properties as public goods. medlib : Message: Relationship between "IndMED" and "Yoga for depression: The research evidence"!! IndMED [ http://indmed.nic.in ] as part of their research methodology. The Cleveland Clinic Disease Management Project is a good source for practical treatment strategies developed by physicians. There is no cost to view the material and there are no barriers to accessing the content. It has 40 chapters covering 10 medical specialties authored physicians from The Cleveland Clinic. The Treatment recommendations are tied to national practice guidelines, wherever possible. Citations within the chapter are hyperlinked to a list of references. Are Traditional Peer-Reviewed Medical Articles Obsolete? BIBLIOMETRICS AS A RESEARCH FIELD: A course on theory and application of bibliometric indicators. W. GLÄNZEL. COURSE HANDOUTS. 2003. There are many search engines and many ways to gain access to the online medical literature. At the moment, however, Google is the most widely used. Other widely used search tools are PubMed, a federal government portal that offers access to the enormous database of citations and abstracts at the National Library of Medicine; Google Scholar, which specifically searches the scholarly literature; and Yahoo, the search engine of the Sunnyvale, California, company of the same name. These search engines are available to anyone who has an Internet connection; none require registration, and searching is free of charge. "Fighting fires may sound taxing, chasing criminals demanding, but a new study says that working in library is the most stressful job of all." at least signifies that the report is of unusually high quality.’..
New research shows that people in online groups contribute more when issued a challenge and when they believe their efforts provide a unique benefit. Get others to add themselves. It's easy and fun! Frappr! What's Digg? Digg is a technology news website that employs non-hierarchical editorial control. With digg, users submit stories for review, but rather than allowing an editor to decide which stories go on the homepage, the users do. Statistic data on number of posts per day. A post is a bookmark a user adds to his collection. Google’s impact on the way we do business has already created profound changes in usage patterns at our libraries. As Google continues to pursue their digitization strategy, libraries will feel increasing pressure to provide services that both compliment and diverge from Google. The frantic search to find our niche is only beginning. Google’s rise to an information uber-gateway is a very real delineation: we’re already using terms like pre-Google and post-Google. While post-Google doesn’t mean L2, the need to find purpose or relevancy (as Sarah suggests) in a time when it’s impossible to compete with Google is a driving force behind L2. It’s clearly something that hasn’t happened before. Just going through my Photographs at FLICKR. Hey This one is interesting - ARD Prasad taking class in Open!! 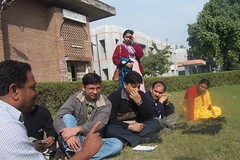 during a training programme at AMU on DSpace. Yes, Open Source should be taught in Open. Will 2006 be the year of the mashup? Originally used to describe the mixing together of musical tracks, the term now refers to websites that weave data from different sources into a new service. They are becoming increasingly popular, especially for plotting data on maps, covering anything from cafés offering wireless Internet access to traffic conditions. And advocates say they could fundamentally change many areas of science — if researchers can be persuaded to share their data. Allen, James (2005) Interdisciplinary differences in attitudes towards deposit in institutional repositories. Masters, Department of Information and Communications, Manchester Metropolitan University (UK). The attitudes and behaviours of academics from different disciplines towards depositing their work in institutional repositories are compared. This is achieved through the use of a survey strategy, and by examination of the contents of a twenty-five UK institutional repositories. The survey targets humanities academics, and the data is compared to that from previous surveys focusing on scientific, technical and medical (STM) disciplines. The number of humanities documents in institutional repositories is currently far lower than that in STM disciplines. Awareness of Open Access amongst humanities academics is also low. However they perceive many advantages to depositing their work in institutional repositories, especially for the reader, not for themselves. Around two-thirds of respondents would deposit work in institutional repositories, despite having several concerns. Those who would not deposit work in this way perceive the same disadvantages: potential for plagiarism, the apprehension of interfering with publishing their work elsewhere, and the fragility of online means of dissemination. Increased depositing in institutional repositories in the future depends on encouraging authors of the advantages of doing so, not only to others but also to themselves. At this early stage of development understanding the attitudes of academics in different disciplines is crucial. Swan, A. and Brown, S. (2005) Open access self-archiving: An author study. Technical Report, External Collaborators, Key Perspectives Inc..
With "Web 2.0" on everyone’s lips, it seems like every bright mind on the Web is focused on building the next killer app. Small and focused seems to be the flavour of the month: Gmail is great at email, Flickr nails photos, and CalendarHub and its ilk have got calendars just about licked. But as we embrace each of these disparate services, we further segment the data we rely on day-to-day, making it more difficult to use them together when we need to. If you believe the pundits (yours truly included), openness and standards compliance are two of the characteristics that should define any true member of the Web 2.0 stable. Any data you put into a Web application should be available to pull out again in a portable format, and should be accessible to other applications through well-documented APIs. The use of journal impacts in evaluating individuals has its inherent dangers. In an ideal world, evaluators would read each article and make personal judgments. The recent International Congress on Peer Review and Biomedical Publication (http://www.jama-peer.org) demonstrated the difficulties of reconciling such peer judgments. It's a 1964 recording of the great librarian S.R. Ranganathan giving a fifteen-minute talk about his connections with Melvil Dewey. Skill Kit articles provide search hints, review system features, and cover data and indexing issues for NLM® databases, expanding your search skills and knowledge. Innovative, interactive technologies provide new potential for learning—in and out of classrooms. Since health information on the World Wide Web is of variable quality, methods are needed to assist consumers to identify health websites containing evidence-based information. Manual assessment tools may assist consumers to evaluate the quality of sites. However, these tools are poorly validated and often impractical. There is a need to develop better consumer tools, and in particular to explore the potential of automated procedures for evaluating the quality of health information on the web. It also has shortcuts to NCBI resources. Basic Googling the easy way! Soople.com, though not affiliated with Google, will help you refine your search tasks and teach you the commands. Easy. Librarians have been part of the online environment for decades. It didn't take long for them to get excited about blogs. This list shows the most influential librarian blogs, based on LinkRank. Sukhdev Singh, and Naina Pandita, Building the open access self-archiving repository for the bio-medical sciences at National Informatics Centre, in: National Convention of Medical Library Association of India, November 7-9m 2005, Bangalore, India. Abstract: Self-Archiving is an important model of the Open Access movement. National Informatics Centre has been providing various services and products to the biomedical community. Building up a Self-archiving repository for Bio-medical and Allied sciences was a natural extension of these activities. To make this repository interoperable with other such repositories Open Access Initiative Protocol for Metadata Harvesting (OAI-PMH) was adopted. The selection of suitable software for the archive was done from OAI-PMH compatible softwares. GNU EPrints was finally selected. A prototype was build for planning of activities, demonstration and checking security aspects. To provide subject-wise browse view to the archive a MeSH based categorization was adopted. A dedicated server was procured and installed in the NIC Network Domain under RedHat Advanced Server Version 3.0. EPrints software was then installed and customized. Making scientists and authors aware of Open Access and its benefits remains a major challenge for any such attempt. However efforts are bearing fruits in the form of Open Self-archiving repository for Bio-medical and Allied Sciences i.e. OpenMED@NIC. Pharmpedia is a free content Pharmaceutical encyclopedia, written collaboratively by people from all around the world. The site is a wiki, which means that anyone can edit articles, simply by clicking on the edit this page link. It runs on MediaWiki software. Pharmpedia began on May 1, 2005 by founder Raja Vege,Toronto,Canada and a few enthusiastic pharmacists in Canada, USA and India. As of today, there are 747 articles in English language.